Mohammad E Rangiha completed his PhD at the Centre of HCID focusing on Social Business Process Management under the supervision of Dr Bill Karakostas, Dr Marco Comuzzi and Professor Neil Maiden. 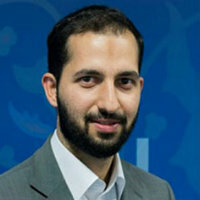 Born in 1986 in Guildford, Mohammad joined the City University London in 2004 and completed his BSc in Computer Science in 2008 having taken an industrial placement at IBM working as a Business Support Officer. Mohammad then carried on with his Postgraduate studies and completed his MSc in Business Systems Analysis and Design at City University London. In addition, Mohammad holds a Master’s degree validated by the Middlesex University. Furthermore, Mohammad also has years of industrial experience having worked at IBM, NHS IC (Information Centre), Xerox Cooperation in business process management related roles ensuring the effective implementation, management and support of business processes. Mohammad, currently, is working at Moody’s Corporation as a Senior Application Support Analyst and is also a visiting lecturer at City, University of London teaching a joint Undergraduate and Postgraduate module, Business Engineering with ERP Solutions (INM342/IN3003) and supervising a number of MSc dissertations. Mohammad has published a number of papers and presented at national and international conferences. duha, S. and Rangiha, M.E. (2019). Social Business Process Management (SBPM). In: Daniel F., Sheng Q., Motahari H. (eds) Business Process Management Workshops. BPM 2018. Lecture Notes in Business Information Processing, vol 342. Springer, Cham. Duha, S. and Rangiha, M.E. (2019). Social Business Process Management (SBPM): Critical Success Factors (CSF). Gokaldas, V. and Rangiha, M.E. (2018). A Framework for Improving User Engagement in Social BPM. In: Teniente E., Weidlich M. (eds) Business Process Management Workshops. BPM 2017. Lecture Notes in Business Information Processing, vol 308. Springer, Cham. Gokaldas, V. and Rangiha, M.E. (2018). A framework for improving user engagement in social BPM. Rangiha, M.E. and Karakostas, B. (2015). The use of social tagging in social business process management. Rangiha, M.E. and Karakostas, B. (2014). Process recommendation and role assignment in social business process management. Rangiha, M.E. and Karakostas, B. (2014). A Goal-Oriented Social Business Process Management Framework. The International Conference Business Process Management (ICBPM). Rangiha, M.E. and Karakostas, B. (2014). Towards A Meta-Model for Goal-Based Social BPM. BPM 2013 Workshops. Rangiha, M.E. and Karakostas, B. (2014). Towards a meta-model for goal-based social BPM. Rangiha, M.E. and Karakostas, B. Business Process Management Driven by Social Customer Behavior. ER 2013 conference. Rangiha, M.E., Comuzzi, M. and Karakostas, B. (2016). A framework to capture and reuse process knowledge in business process design and execution using social tagging. Business Process Management Journal, 22(4), pp. 835–859. doi:10.1108/BPMJ-06-2015-0080 . Rangiha, M.E., Comuzzi, M. and Karakostas, B. (2015). Role and task recommendation and social tagging to enable social business process management. Lecture Notes in Business Information Processing, 214, pp. 68–82. doi:10.1007/978-3-319-19237-6_5 . Ehson, M. and Karakostas, B. (2014). Process Knowledge Discovery in Social BPM. International Journal of Advanced Computer Science and Applications, 4(3). doi:10.14569/specialissue.2014.040305 . Rangiha, M.E. and Karakostas, B. (2013). Goal-driven social business process management. Proceedings of 2013 Science and Information Conference, SAI 2013 pp. 894–901. Ehson, M. and Karakostas, B. (2013). A Socially Driven, Goal-Oriented Approach to Business Process Management. International Journal of Advanced Computer Science and Applications, 3(4). doi:10.14569/specialissue.2013.030402 . Fourth International Conference on Computational Science and Engineering (CSE-2016), Program committee member / Reviewer. International Journal Series in Multidisciplinary Research (IJSMR), Editorial board member. Sixth International Conference on Computer Science and Information Technology (CCSIT 2016), Committee member / Reviewer. Second International Conference on Computer Science, Engineering and Information Technology (CSEIT-2015), Program committee member / reviewer. ICBPM 2014 Conference, Session Chair. Learning Robotics Journal, Editorial board member. Social BPM workshop (BPMS2-2018), Program Committee member.